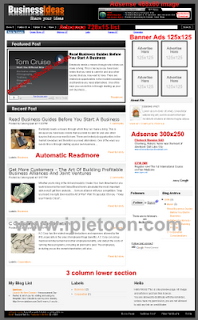 Introducing my new blogger template design, Business Ads Ready blogger template. As its name, this template ready for adsense. You can check demo or screenshoot. There's four section for placing adsense code set through page element. It's really easy to customize. At right top section, you can place your adsense 468x60, suitable for image type. Check featured post. You can place your best post, and put your adsense code. I recommend image adsense because it will appear like image post. Under navigation menu, you can set adsense list that will appear like menu. I also offer footer link. Why I should buy footer link? That's a cheaper and easier way to spread your link. What's the advantage? With reasonable price, you get unlimited link. mbak tombol download-nya dimana ? aku ga nemu ? wekekeke. find your success way :D.
untuk iklan adsense yg deket dengan menu pop up, katanya bisa melanggar aturan adsense?? Sites showing Google ads may not contain pop-ups or pop-unders that interfere with site navigation, change user preferences, or initiate downloads. Situs yang menampilkan iklan Google tidak boleh berisi pop-up atau pop-under yang mengganggu navigasi situs, mengubah preferensi pengguna, atau memulai proses download. Iki apik tenan bong, seng bikin aku kagum tuch headermu kuwi, apik tenan..
Ternyata masih blm ada link donlotnya ya..
Engko kabari ya bong nek wes enek file..
Awas gak ngabari, hajar wengko..
ak pake yah templatennya....thanks mba bong..
is this available in wordpress?? How much does it cost to place footer link for this template? thank you very much.I already use it for my blog. Check it out http://golf-swing-mechanics.blogspot.com. could you edit the "read full story" thingo? could you make it a button instead of the text "read full story"? Thank you very much. your blog is very interesting and attractive. terima kasih theme sudah saya pakai. bagaimana untuk menampilkan tanggal posting nya, tolong dibantu mbak. mbak cantik deh. endi link donlote mbak mbong? I am considering it. Thanks. i like this template, I will surely use it! @aloha:hehehehe at last you change template..how are you? wew, how much thats thems? Templatenya bagus, sekarang lagi saya rapihin maklum masih belum paham html. bagaimana untuk mengubah background pada post dan judul widget agar menjadi biru tidak abu-abu, karena saya ingin agar blog saya dominan warna birunya. hilang url pada background, dan ganti dengan kode warna biru. @admin: kalo feature post'y supaya rapi seperti demo gimana ya cara'y? mohon dibantu. asya neh pendatang baru... bangets.. pengen deh seperti anda2 blognya keren 2 penuh isi.. yang bermutu.. ynag pasti mendaptkan hasil dari apa yang anda lakukan " secara material".. mohon arahannya dunk ..
A great looking template - thanks! I am using this template at www.i-blogger.info but I am wondering how to remove the featured post after I put it on there. Page Navigation Problem Help Me! Check Inside Post! page navigation not there! tell Me How to Fix it! hi!hope u can help me..
how to fix page navigation problem on this template baddass! I would like to use this theme for my new blog, thanks for share. Need your help as soon as possible. Eh pple Chek my Blog Out ! Im nu To This ! Plz Comment ! Great... I would like to use this theme for my new blog, thanks for share. Hi, how can i add 'You may also link this link' below every post? thanks. templatenya bagus nih. SAya izin untuk menggunakannya. You really have so many knowledge about this issue, and also so much passion. You actually know how to make people rally behind it, obviously from the responses. Cloth Diapers Introduction Pampers Swaddlers Newborn Disposable Diapers Tips Pampers Cruisers Size 3 Cloth Diapering Pampers Baby-Dry Size 3 Prefold Diapers Pampers Newborn Diapers Fitted Diapers And you have got a design here that is not too flashy, but it's makes a statement as big as what you are saying. Yead, i like this theme. Your listing so nice and collection very well. Thanks Introducing business ads ready. I was reading Pizza Hut. I noticed that they offered Pizza Hut Coupon Codes. What did I do with the Pizza? I ate it. I love best buy, thats why i love their best buy promo codes. it lets me save a lot of money! I love online shopping and always looking for some discount promo codes, coupon codes, online coupons because it's save my money. Thanks for the great post. Nice one as always you are upload nice and simple templates thanks. Hi,Seems like it’s a nice blog. So let us also add something useful in it. Trading in volatile market can be very fruitful also if we follow technical levels closely. It’s a common saying that stock market can change fortune in either way. But now the question is how to earn money from the Indian stock market. Traders are advised to strictly follow technical analyses and investors can follow fundamental analysis. Many analysts say it’s not wise to follow technical and fundamental analysis together. But we say what the problem is if one does so? As more knowledge will add up things will not have any negative impact. Really nice post you introduce a nice template for me which help me to create business add. You can place your best post, and put your adsense code. I recommend image adsense because it will appear like image post. Under navigation menu, you can set adsense list that will appear like menu. I'm really loving this template, can't wait to try it out. Thanks a bunch! I recommend image adsense because it will appear like image post. I recommend image adsense because it will appear like image post. Under navigation menu, you can set adsense list that will appear like menu. Traders are advised to strictly follow technical analyses and investors can follow fundamental analysis. Many analysts say it’s not wise to follow technical and fundamental analysis together. There's four section for placing adsense code set through page element. It's really easy to customize. Your blog will appear neat because of automatic readmore function. Great theme for my new customer, I will definetly try this one and see how it looks. This is brilliant. I love the sharing. Totally amazing look, I give it a plus 10 points for the design, but need to see the post and pages to see how it looks.. thanks a lot for sharing. Nice one for businesses, but I don't think adsense would do much for you to earn. More likely you earn from the content of your business itself, except if your using this theme for online business, Then i'd say adsense can help you. Does this theme had a preview site, I mean demo edition? I love to see how this works. But Great and fabulous look as i see it. I appreciate for sharing the theme. Love it.